What happens when we reject the invitation? Flowing streamers hung from the chandelier, Happy Birthday balloons bobbed in the air and a pink cover draped over our dining room table to complete the look. Several times we ran over our checklist. Chocolate cupcakes made? Check. Ice cream and snacks purchased? Games in order? Check and double check! This party had been a tough one to throw together. My daughter’s birthday landed close to a holiday and easily people’s agendas could get crammed. But still, we attempted to squeeze a party in. Our guest list was small to begin with, so we were excited when a third mother told us her child could come. But, as the party day drew nearer, the cancellation calls began to come in. And in the end just one little girl came and sat at our table that had been set for many more. An odd range of emotions ran through me that day. And it was tough to get a grip on them all. Most of all, I guess I just hurt for my daughter. As a mom, I wanted the party to be perfect for her. Now, I’m not blaming the friends we invited. People get busy and things come up. And, our guest list was small to begin with. I know, I’ve probably cancelled out on a few parties myself. But still, I struggled to shake the sinking feeling I had in my gut --only one guest? Ugh! Suddenly, I thought about another party. A great banquet that was given by a certain man. Jesus tells a parable about his party in Luke 14. You see the man preparing the banquet had invited a lot of people and when the food was all ready, he told his servant to go out and tell those who had committed to come that it was time to eat. Did people come rushing in? Did they honor their initial R.S.V.P.? They all were caught up with their lives. One was busy looking at a new field, one was trying out a new purchase, yet another was spending time with his wife. The man throwing the banquet became angry and do you know what he did? He threw all the food out to the pigs and sulked right? Not quite. He made some quick revisions to his guest list and sent his servant out to invite the poor, the crippled, the blind and the lame. And even after they all came – there was still room. So he had his servant go out and call even more people – so his house would be full. Wow. I liked that man’s quick recovery and wished later that I had gone knocking on a few of our neighbor’s doors the day of our own party. What a great solution that would have been – and improv neighborhood birthday party! But you do know what Jesus was really talking about right? 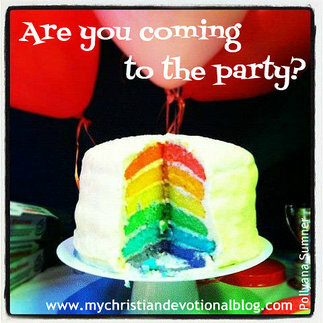 It’s the great party we are all invited to – the one that involves life everlasting. You see, God offers this great and wonderful invitation to all of us, but sometimes our lives are wrapped up in other things and we choose not to receive it. And I think that one of the most important things to remember about this parable is the fact that the invitation will not last forever. It didn’t take the man giving the dinner party long before he came up with a new plan, did it? He didn’t pine over the ones that didn’t come. But turned around and invited others. God is love. But his also just. And we can forget that sometimes. Some of us maybe feel like we can respond to Jesus in our own time, but if we really understand the parable in Luke 14, we see that at any moment – God can pull our card. When he says the invitation isn’t going to last forever – I think we need to take him at his word. Are you coming to the party? I hope so – now is the time. 20 Behold, I stand at the door and knock; if any one hears my voice and opens the door, I will come in to him and eat with him, and he with me.